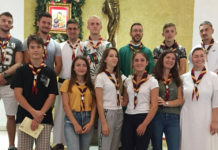 (Saigon, Vietnam) The Redemptorist Youth Missionaries guided by Fr. 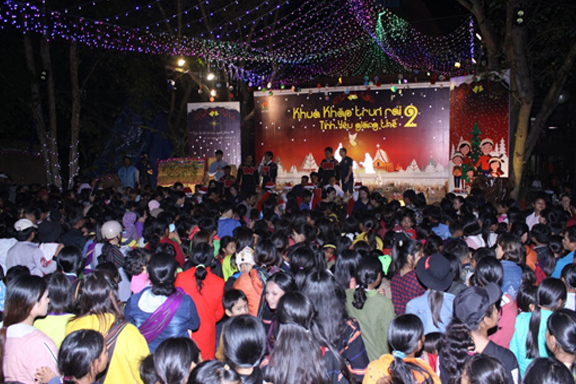 Alfonso Tran Ngoc Huong CSsR had memorable Christmas celebrations with the Jrai Ethnic group in Saigon from 21st to 23rd of December. In spite of the busy schedule of study and work of children and parents, we got an opportunity to come back to Plei Kly to share the happiness with indigenous people there. 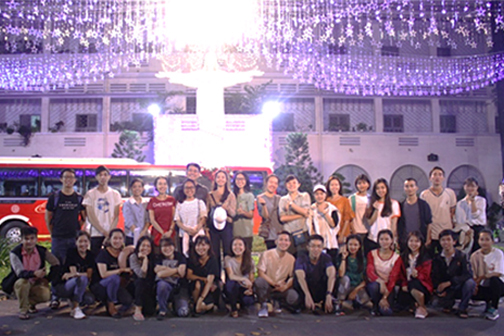 On the 21st morning, we gathered at the Redemptorist community at Saigon and loaded the bus with food packs for people and the necessary luggage for our stay. The journey to Plei Kly began at 8 am, which is 500 km from Saigon. After a long journey, we reached Plei Kly in the next day morning. We had planned what all to be done. Therefore, immediately we arranged the stuff we had and we had breakfast together. Fr. 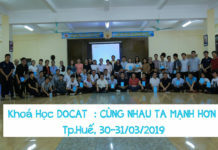 Joseph Nguyen Dac Thinh C.Ss.R. a Redemptorist missionary and the people at Plei Kly welcomed us joyfully. We could feel the happy atmosphere while having breakfast together. 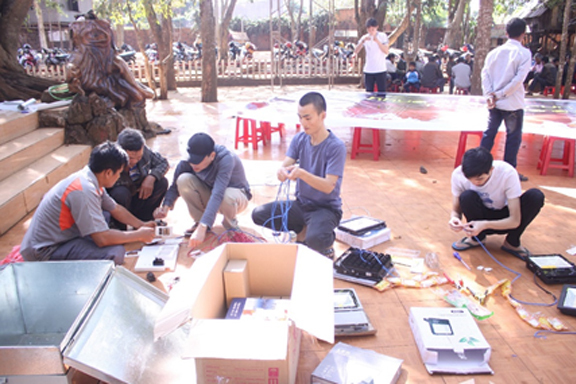 After our breakfast, we were divided into two teams: one wrapped the gifts for Plei Kly children, and another set up the stage for the evening programs. On this occasion, Jrai ethnic group were also involved in such activities. They are very friendly in nature and enthusiastic about working together. As a result, we quickly finished wrapping gifts in the morning. Then, we had lunch with many special delicious dishes prepared by Jrai people. After cleaning up, we started packing the gifts to be given to the families there at 1.30 pm. The people cooperated very well. What impressed me most was the silent atmosphere during the speech of Rev. Joseph Thinh (in Jrai: Ama Thinh). Before receiving gifts, the families prayed and sang together to thank God for giving them many things. Meanwhile, the stage work was over by the other group. We too had stage rehearsal to make sure that everything was ready for the evening performance. 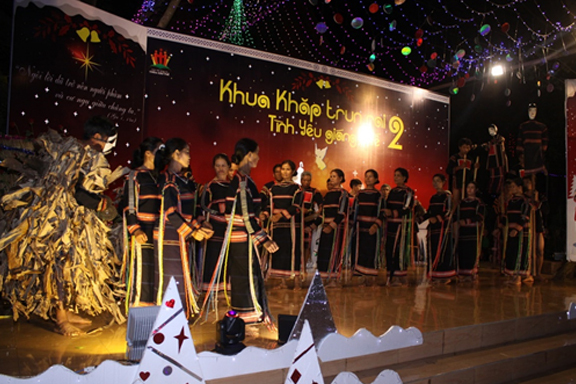 On this occasion, the nuns of Phu Cuong, Son of Mother Group also joined us. The mass began at 6 pm in the church. Jrai music instruments accompanied the singing. 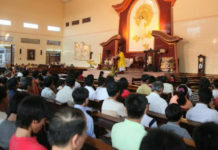 When the mass finished, everyone gathered in front of the stage to enjoy the stage performances. 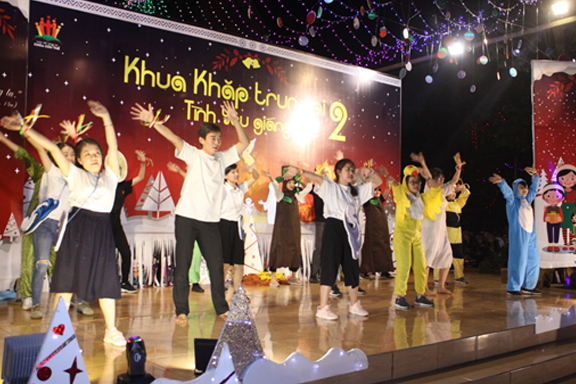 In the evening at 7:15 pm, KHUA KHĂP TRUN RAI 2 – CHRISTMAS LOVE 2 began. The first performance was mysterious and sparkling, the play on the creation of God was enacted, which reflected the beautiful nature of God. However, people seemed sad when they saw the fall of human beings as Adam and Eva ate the forbidden fruit and sinned against God. Then, God promised to send His son to save His people. This was presented through the Annunciation scene. Nevertheless, people still wanted to be away from God, they immersed themselves in the pleasures of the world. This lead to divisions, in the families, workplaces, in relationships, etc. Finally, God appeared and people were saved from their sins. Jrai people also shared the stage by their traditional dance performances, based on their culture and life. The program ended with the funny dance by a group of Santa Clauses. 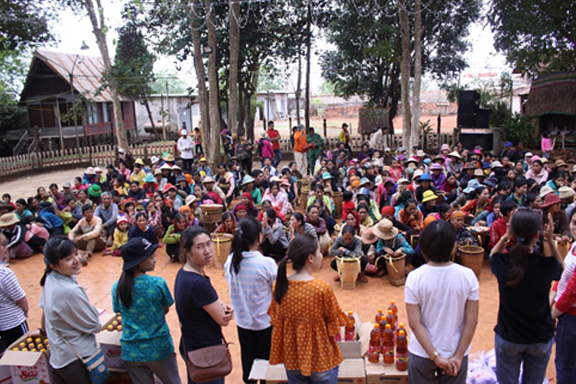 Next, Ama Thinh asked local people and children to stand in the queue to receive gifts. We had packed 1800 gift packs for the evening. 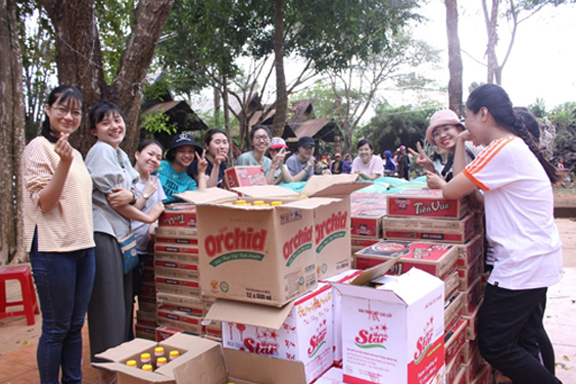 A few packs remained after the distribution. In the end, we finished a memorable day in Plei Kly by a warm dinner with the indigenous people. They had prepared many special food items for us, like cơm lan, rượu cần, etc. 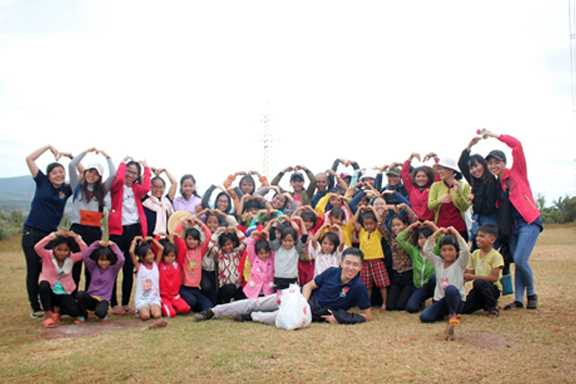 On Sunday 23rd December all of us were excited to take part in all the activities. We began the day with the Holy Mass together with Jrai people. 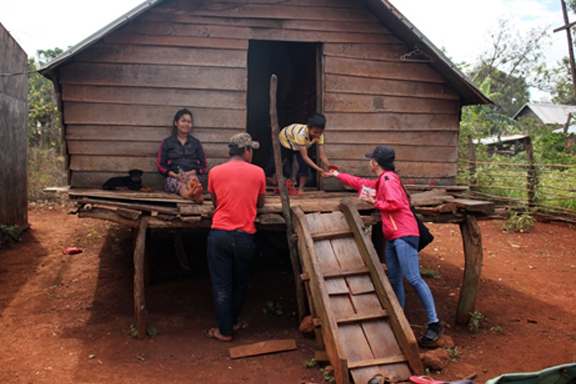 Soon after the breakfast, we were divided into 4 teams to visit nearby villages in Plei Kly. Our team set to visit the village called B Rieng. 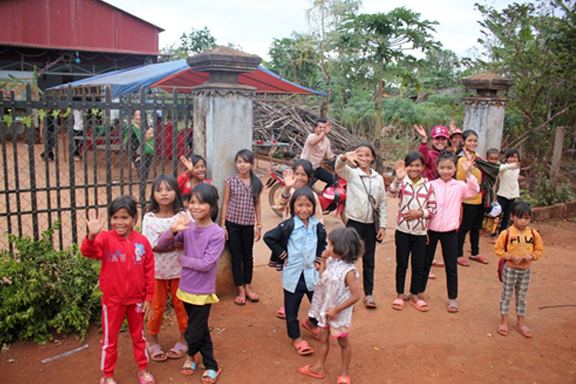 We moved to this village by a vehicle called “công nông”, and it was really an exciting experience. One should try that when visiting that village. After a long journey, we stopped at the house of a senior man. He accompanied us to visit the nearby houses. In this village, the people are better off. Mostly they do business so that their lives are better than others are. Besides, there are some poor families with two members; because their children had abandoned them. However, they still live happily and were thankful to God for bringing us to them. The rural surrounding was beautiful. We came across cattle grazing, peaceful atmosphere, which rarely found in an urban setup. After visiting the families and praying for them, we had lunch with people in B Rieng village. The dishes were prepared in a special way. They explained the origin or each food item to us. Besides serving the food, they also welcomed us with the wine called “ruou can”. Their welcoming gestures and love are reflected in their hospitality in serving drinks. This is one of the remarkable parts of Jrai culture. In the afternoon, we sang, danced, and played games together. The children of Jrai were very happy and excited to join in all these activities. Finally, it was time to return back from the village. Before leaving the village, all of us prayed with Jrai people. We all hope and pray that God will always be with them, in their loneliness and tough situations and may continue to live a happy life. After visiting the villages, we gathered in front of the church to thank everyone who helped us in all the programs. We thank Ama Thinh in a special way and Jrai people for welcoming us open heartedly. 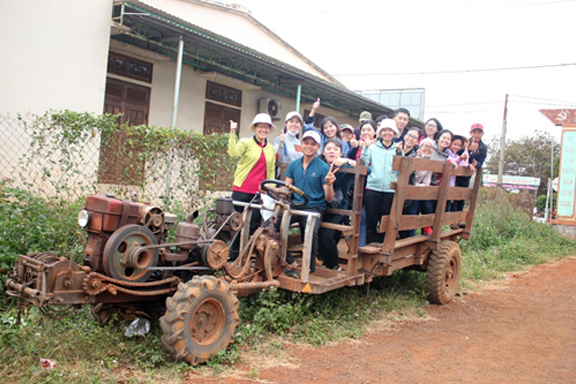 All of us returned to Saigon with full of happy memories of Plei Kly.